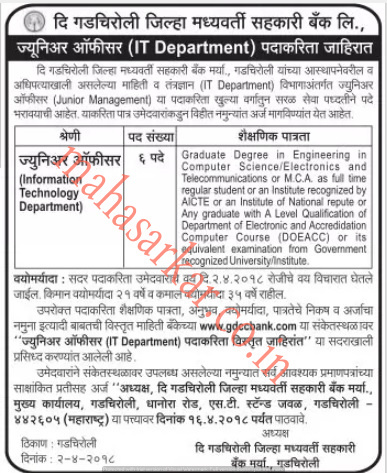 GDCC Bank (The Gadchiroli District Central Co-operative Bank),Gadchiroli Published Job Notification for 06 Jr. Officer Posts. Candidates who wish to apply must look at GDCC Bank Jr. Officer Recruitment 2018. Eligible candidates can apply Offline before 16-04-2018. Education Qualification: Graduate/Engineering/MCA and More. For Post wise Education Details follow the detailed advertisement. Age Limit: 21-35 Years as on 02-04-2018. Interested & Eligible candidates can send their application along with all the necessary documents and testimonials to The Gadchiroli District Central Co-operative Bank, Near ST Bus Stand, Dhanora Road, Gadchiroli, Taluka Gadchiroli District Gadchiroli. Starting Date, Last Date to Apply Offline at The Gadchiroli District Central Co-operative Bank which candidates should be remembers as follows. Start Date to Apply Offline: 02-04-2018. Last Date to Apply Offline: 16-04-2018. GDCC Bank (The Gadchiroli District Central Co-operative Bank),Gadchiroli Published Job Notification for 58 Junior officer & Clerk Posts. Candidates who wish to apply must look at GDCC Bank Junior officer & Clerk Recruitment 2018. Eligible candidates can apply Online before 13-02-2018. Education Qualification: Must Have MSCIT and More. For Post wise Education Details follow the detailed advertisement. Interested & Eligible candidates can apply online through the website www.gdccbank.in earlier than the due date. Starting Date, Last Date to Apply Online at The Gadchiroli District Central Co-operative Bank which candidates should be remembers as follows. Start Date to Apply Online: 05-02-2018. Last Date to Apply Online: 13-02-2018.